"Maybe Dell was ahead of its time." No, that's not a typo, we did mean to write Dell. When we first saw the Sony Xperia Z Ultra, we couldn't help but think back to the Dell Streak, a 5-inch device announced back in 2010 as a "tablet that can make calls." While calling 5-inch devices 'tablets' seems ridiculous now, in the pre-Galaxy Note era, people had a different mindset about display sizes that were acceptable on a device that's designed to sit in your pocket. The Dell Streak was almost universally panned, and while the poor execution probably had as much to do with it, as the size of the display itself, it's fair to say that the Dell Streak would probably get a more favourable reception now, and in fact, may even be called 'not big enough' by some! Yes, that's how radically the landscape has changed in the last three years, and it is in this world that the Sony Xperia Z Ultra makes its debut. While we are personally no fans of ultra large-screen phones, we realise a market exists for such devices, even if the likes of Xperia Z Ultra and Huawei Ascend Mate are intent on stretching the acceptable limits. So, has the Sony Xperia Z Ultra gone too far, or does it tick the right boxes? Let's find out. 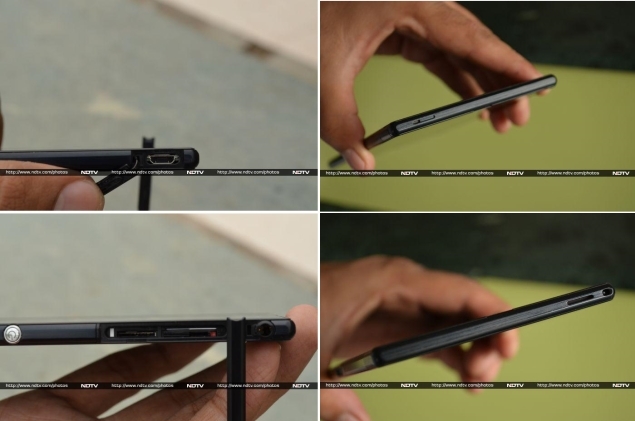 At first glance, the Sony Xperia Z Ultra looks like a slab of premium chocolate - it sports the same rectangular design, and is about the same thickness, and the Black colour variant looks especially biteable. Pick up the phone and try getting your fingers around the width of its display and you realise that the phone just about fits in your hand, if you have big hands that is. If you have a tiny frame, forget about trying to get your fingers around the sides of this monster. Don't even think about trying to operate the phone with just hand, unless you have it resting on a surface. The Xperia Z Ultra is a big phone, which stretches the definition of the phrase big phone. At 179mm, or an incredible 7.05-inches long, even those with large hands will be unable to fit the length of the phone in one hand. If you plan to, say, watch a movie on the phone in landscape mode, forget about snuggling this behemoth in one hand - putting both your hands to use is a must. Once you get past the sheer size of the phone, you realise that the Xperia Z Ultra is one solidly-built device. The phone has a plastic body built around a metallic frame, which lends it an air of solidity, and a premium feel when holding the device. At just 6.50mm thin, Xperia Z Ultra is sleek, and indeed the 'slimmest full-HD smartphone', as Sony loves to claim. In a phone that's super-sized on everything else, this comes as a very welcome change. Carrying the Sony Xperia Z Ultra is a challenge of its own. Some may be able to fit it in the front pocket of their trousers or jeans, but will have to take it out if they want to sit without being constantly poked. Keeping it in the back pocket is an option, but the Ultra is sure to stick its neck out - and beware of accidentally sitting down with the phone still in your pocket! The left edge of the Xperia Z Ultra has the dock connector in the middle and the Micro-USB port towards the top. Since the Xperia Z Ultra is a waterproof phone (a claim we were not tempted to test), the Micro-USB port and the microSD and Micro-SIM slots (present on the right edge) are protected by flaps. The right edge also houses the power button (in the middle) and, right below it, the volume rocker. The power button is a circular, metallic button also seen on the Sony Xperia Z and the Sony Xperia Z tablet. While the design makes the power button stand out visually, it also greatly reduces the target area of the button, and we would've preferred a larger button made of plastic. The Sony Xperia Z Ultra comes with a 6.44-inch full-HD display with a resolution of 1080x1920 pixels. While the pixel density takes a hit due to the humongous screen size, at around 340ppi, most won't notice the difference in the quality of text and images, though the display is definitely not as sharp as the one seen in, say, the HTC One. 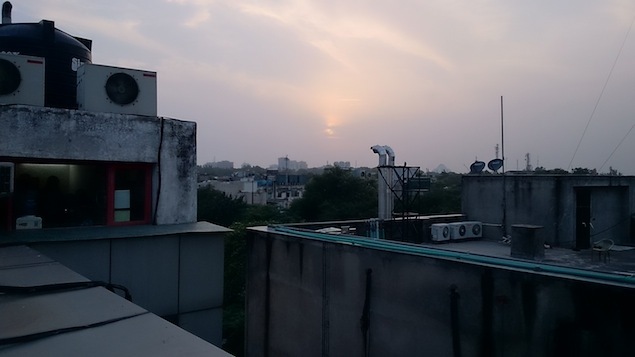 Outdoor visibility of the Xperia Z Ultra is about average, and at times we were definitely wishing we could take the brightness a notch higher, even when at full brightness. Viewing angles are good. 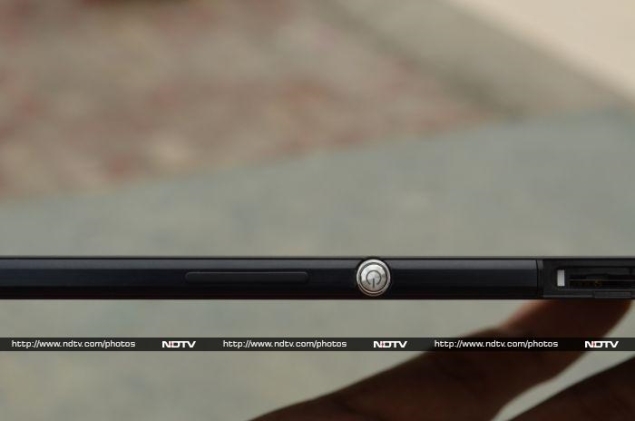 Sony has put the extra real estate on the Xperia Z Ultra to good use, with a strip at the bottom housing the three on-screen Back, Home and App Switcher buttons, and still leaving more than enough space for content. One side-effect of the Xperia Z Ultra's extra-large display is that at times the content looks odd when scaled up. For example, in the official Twitter app the four columns appear extra-wide. While the Sony Xperia Z Ultra does not bundle a stylus, the screen will recognise taps from a stylus, or even a pen or a pencil, if you prefer to use your device in that manner. The camera on the Sony Xperia Z Ultra is a bit of a mixed bag. The images look good on the phone's display or when you are viewing images at the default zoom level. However, zoom in to 100 percent and you'll notice that the objects lack detail that even our two-year old iPhone 4S was able to capture. 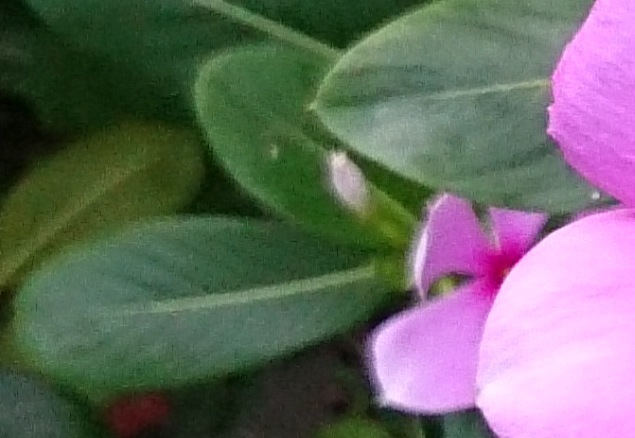 This problem gets accentuated when clicking pictures in macro mode. However, the low-light and indoors performance of the camera is better than what we've seen in most phones, though the Xperia Z Ultra won't have the leaders of the pack in the category, the iPhone 5 and Nokia Lumia 925, looking over their figurative shoulders. The Ultra comes with a comprehensive camera app, with presets and settings for pretty much every conceivable situation. The phone takes good, fast panorama photos and comes with an unlimited burst mode. The phone does not come with a flash, which is a rather glaring omission. The Xperia Z Ultra captures good quality video, with the ability to zoom in and out, and capture high-resolution stills as the video is being recorded. The microphone is pretty sensitive, and able to capture distant sounds while recording outdoors. 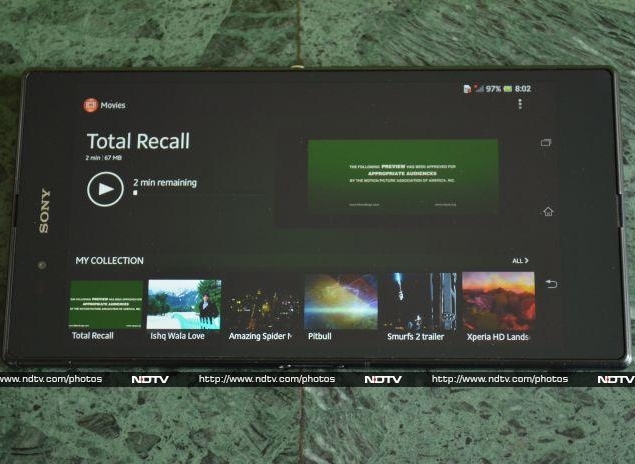 The Sony Xperia Z Ultra runs Android 4.2.2 Jelly Bean and we reviewed our unit after installing the recent firmware update carrying build number 14.1.B.0.471. The Ultra is quite heavy on skinning, customising stock apps and adding a number of pre-installed apps. Like other devices in the Xperia series, you have WALKMAN (for Music), Album, and Movies for media consumption, all with additional functionality and UI touches from Sony. Other pre-installed apps on the Xperia Z Ultra include Socialife (A Flipboard-like app from Sony), TrackID (Sony's answer to Shazam), Wisepilot for XPERIA (GPS-based navigation app), File Commander (a file explorer), Voice Dialer, Word Search, Converter, X4 Video Player (lets you play four videos simultaneously), McAfee Security, Foneclay (live wallpapers), PicsArt (photo editor), Smart Connect (perform actions when certain accessories are connected), X-Alert for XPERIA (Sony's anti-theft solution), Notes, and Drag&Share.The list of bundled apps doesn't end there, with popular apps like Facebook, Chrome, YouTube, WhatsApp, Box, and LinkedIn thrown-in for good measure. If all that isn't enough, Sony has included a bunch of other apps on the Xperia Z Ultra that offer you access to yet more apps and content. Sony Music gives you free unlimited streaming and downloads from Sony's music catalog of Bollywood, international and classical music for a period of 6 months. Sony Select and appXtra showcase popular Android apps, while Xperia Privilege promises special offers for Xperia owners. One of the more useful ones is GL Games, which showcases games by popular developer Gameloft, with popular titles like Asphalt 7: Heat (usually $0.99 or Rs. 55) offered for free to Xperia Z Ultra owners. 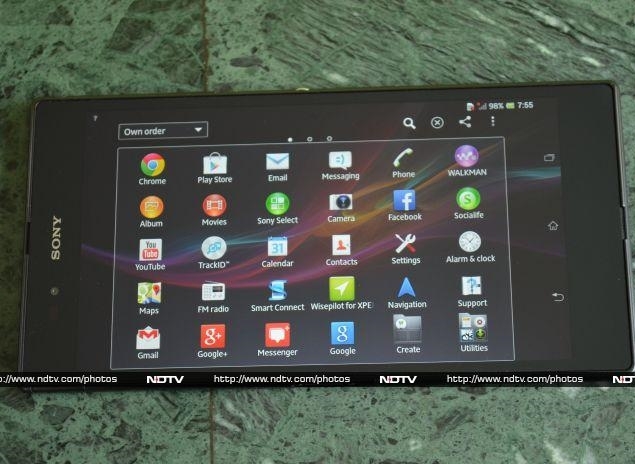 The Indian edition of the Sony Xperia Z Ultra also comes with apps like Sony LIV (free streaming of popular TV programmes from Sony, SAB and MAX), Flipkart eBooks (free eBooks worth Rs. 2,000 bundled), BIGFLIX (with free unlimited streaming of Bollywood and regional Movies for one month), and BSE/NSE Stock Watch.That's a lot of pre-installed apps, and while some of them can be removed, the others will stay with you for good, should you have any use for them or not. We wish Sony had instead pre-installed a single app that offered users the opportunity to download apps it wishes to offer, letting users choose which apps they want. As mentioned earlier, Sony Xperia Z Ultra runs Android 4.2.2 Jelly Bean, which brings features like lock-screen widgets, enhanced notifications, improved Google Now and more. While Android 4.2 may seem like a disappointment to some, it is hardly a surprise given that the phone was unveiled a day after Google announced Android 4.3, and no phones other than Google's own Nexus devices and Google Play editions have received the Android 4.3 update. Sony has promised that the Android 4.3 update is coming before end of this year, but Android 4.4 might be out by then. That, of course, is no reflection on Sony, and merely symptomatic of the problems that plague the Android ecosystem. 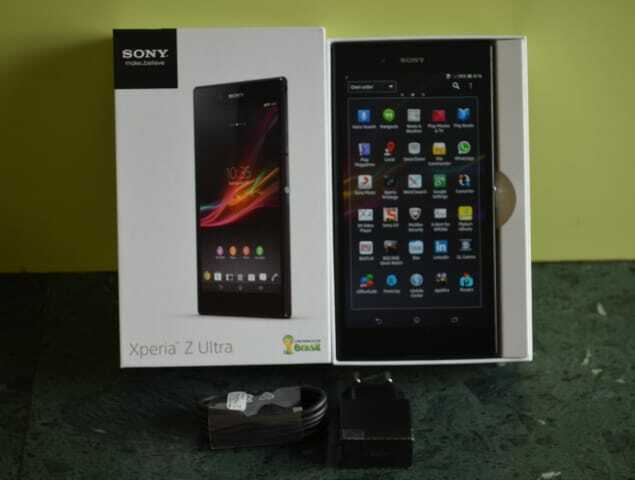 Sony Xperia Z Ultra is powered by a 2.2GHz quad-core Qualcomm Snapdragon 800 processor alongside 2GB of RAM. It's safe to say it is the fastest device we've come across, handling everything that we threw at it with great aplomb. From multi-tasking and switching between apps, to casual as well as heavy duty games, everything was butter smooth. Browsing the Web is a great experience thanks to the large screen and the power underneath, which means even heavy duty websites render almost instantly. The phone's also great for watching videos and the Ultra plays full-HD video natively. If you do a lot of media consumption, be mindful of the fact that you'll need to use both your hands to hold the phone in landscape mode. Thankfully, the phone doesn't feel too heavy despite weighing 212 grams, since the weight is evenly distributed across its large frame. We did have a couple of other gripes about our Xperia Z Ultra unit. The call quality was average at best and we felt that the loudspeaker wasn't loud enough during calls as well as while watching a movie or listening to music. Battery life is another area where the Xperia Z Ultra just about does the job and it should last a full working day with moderate to heavy use. The giant display on the device is a bit of a battery guzzler and power users will likely find themselves reaching for the charger before the day is over. The Sony Xperia Z Ultra is a difficult phone to summarise. It gets a lot of things right - it's a scorcher in terms of performance and the big, full-HD display makes for a great viewing experience. However, it's too bulky for most people, and the large display means the battery life takes a hit. The camera performance could've been better too. At Rs. 46,990, the phone isn't cheap, but that's no surprise given its top-of-the-line specs and performance. Almost everyone we met was excited about the Xperia Z Ultra when they first heard about it or saw it in person. Ten minutes with the phone, though, changed the opinion of 9 out of 10 people and they were calling it 'impractical' in no time. However, the tenth person immediately vowed to get one for himself. That, in a nutshell, is the Sony Xperia Z Ultra - too bulky for most, perfect for a minority who believe big is indeed beautiful. 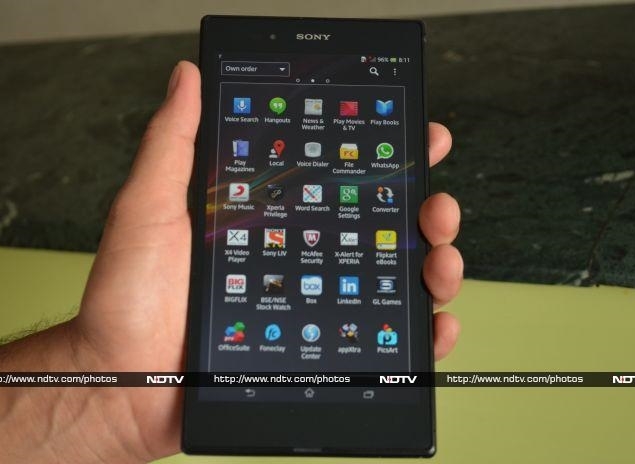 product Has the Sony Xperia Z Ultra gone too far, or does it tick the right boxes? Let's find out.